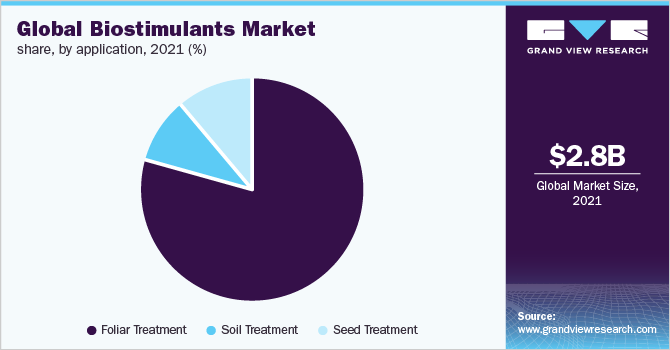 The global biostimulants market size is expected to reach USD 4.14 billion by 2025, according to a report by Grand View Research, Inc., exhibiting a CAGR of 10.2% during the forecast period. Rising focus on improving agricultural productivity through sustainable methods, coupled with degrading soil quality, is fueling demand for biostimulants. 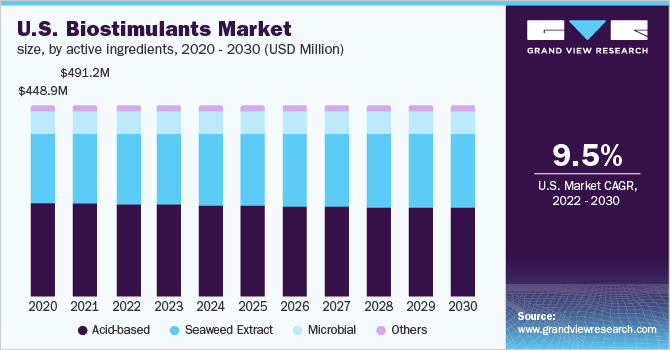 According to a report published by Grand View Research, Inc.; the global biostimulants market is projected to reach around USD 4.14 billion by 2025. Rising efforts to improve agricultural productivity through sustainable methods is anticipated to propel market over the forecast period (2014 to 2025). High adoption of organic farming is expected to further support growth in the forthcoming years. Rise in degradation and pollution of soil and negative environmental effects caused by extensive use of chemical pesticides and fertilizers are expected to fuel market growth. Biostimulants are highly preferred in organic farming due to their environment-friendly nature. These products improve antioxidant activity, root development, and cell enlargement of plants without negatively affecting plant surrounding. This leads to overall improvement of plant health. Rising adoption of the product to avail these benefits is expected to drive demand. However, introduction of biofertilizers is expected to challenge growth in near future. The worldwide biostimulants market can be segmented on the basis of active ingredient, crop type, application, and region. Based on active ingredient, the market can be categorized into acid based, seaweed extracts, microbial, and others. The acid-based segment dominated the market in 2016. Products in this segment include fulvic, amino, and humic acids, which plays a crucial role in overall plant development. Seaweed extracts segment is projected to display notable growth during the study period. These extracts comprise plant growth substances such as auxins, gibberellins carbohydrates, and cytokinins. They also have several nutritive metals like iron, nitrogen, aluminum, potassium, and manganese. On the basis of crop type, the market can be classified into row crops and cereals, fruits and vegetables, turf and ornamentals, and others. The row crops and cereals segment held the largest market share in 2016. The segment is anticipated to continue leading the overall market throughout the forecast period owing to increasing demand for organic cereals. Application in the production of turf and ornamentals is anticipated to support segment growth in the forthcoming years. As per application, the market for biostimulants can be trifurcated into foliar, seed, and soil. The foliar segment is anticipated to expand at the highest revenue-based CAGR of 12.3% over the forecast period. The seed segment is also expected to showcase significant growth in the forthcoming years. Seed treatment is one of the most cost-effective applications compared to traditional spraying practices. This factor is anticipated to bode well for demand over the forecast period. Geographically, the market can be divided into North America, Europe, Asia Pacific, Central and South America, and Middle East and Africa. Europe is projected to be the largest revenue-generating region and is expected to remain dominant throughout the forecast period. This growth can be attributed to presence of supportive policies to improve yield of organic foods. However, sluggish agricultural growth in Western Europe is expected to regional growth to an extent. Asia Pacific is poised to exhibit the fastest CAGR over the forecast period. This growth can be accredited to the presence of agriculture-driven countries such as China, India, and Australia. Diverse income levels, dependency on agriculture as the source of income, and changing spending and food consumption habits are also expected to create lucrative growth opportunities in the regional market. Prominent companies operating in the biostimulants market include Italpollina SAP, Valagro SpA, Biolchim S.P.A., Isagro Group, and Biostadt India Limited. Most companies are emphasizing on providing customized product solutions suitable for specific type of crop and soil. They are also focusing on spreading awareness among consumers to strengthen their market position. Market players are also implementing backward and forward integration to improve profit margins and to gain high trading power. This is expected to increase the competition in the market. Rise in research and development (R&D) activities along with expansion of product range is expected to intensify competition among the players through 2025. Emerging countries, especially from Asia Pacific; are expected to create several business opportunities for market participants.